Here comes a debut album from the Sweedish quintet Axenstar, formerly known as Powerage. The band put out a couple of promo EP's under the name Powerage, but this is the first full length album from the band. When I first heard the album, I was surprised to learn that this is a debut. This album has the sound of a seasoned power / speed metal band. 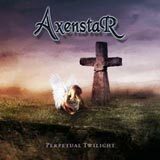 Axenstar play epic melodic power / speed metal, but do it well enough to rise above the ever growing pack of mediocre bands within their genre. The quality of the songs remains constant throughout, refusing to bore the listener at any time. Each of the songs carries a very pronounced, driving riff as the backbone of the sound. The lead vocalist is backed by thick harmony vocals for almost the entire disc. This enhances the melodic quality of the album, and makes up for the lead vocalist's somewhat limited range. No, you won't hear any Halford like wails or Kiske like soaring notes, but the band makes smart use of backing vocals to pick up the difference. If you like dual guitar leads, this album will deliver. Not only does this album highlight some impressive riffs, but the dual leads and solos will have the Maiden fans out there licking their chops. Somehow, Attack's Destinies of War album (see classics section) pops into mind while listening to this album. I think those two albums have some common ground when it comes to song structures (melodies + speed + excellent dual guitar work), although the two albums have a much different overall feeling. Perpetual Twilight is also enhanced (not drenched) with the use of keyboards. This is just enough to give the album a nice epic feel. The subdued keyboard textures mesh very well with the melodies of the album to maximize the impact of the songs for the listener. For a debut album, the production is actually pretty good. In order to reach "masterpiece" status, a bit bigger production might be needed. Also, the vocals seem slightly lower in the overall mix of the album than they should be. Had they been turned up a little in volume, the nice harmony vocals would have been enhanced even more. All in all, this is a very impressive release, especially for a debut album. Excellent musicanship and mature song compositions. I'm sure these guys will only get better. Keep an eye on these guys….